How come that the figure for 0 - 160 kph is 13 s, and 0 - 100 mile is 11.8 s? I thought 100 mile is 160 km ... well to be precise 100 mile is 160.934 km. So actually 0 - 160 kph should be less than 11.8 s !!!! Of-course they do better, I already timed an 8.44 s 1/8th & 12.84 s 1/4 with stock power. I beat every 5.0 Mustang I raced through launch, 0-60, 330', & 1/8th - even for my slow passes, it still won every 0-60. It also traps 107-108 mph. It demolished the R/T's, & I beat the 470 hp SRT's. The SS's have no chance against a 370Z Coupe auto. The Z has to race a 550 hp ZL1 through the 1/8th. The Z's races vs the pony V6's was a complete massacre. 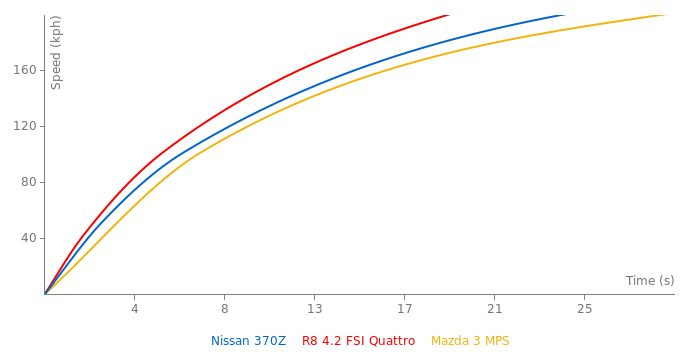 The 370Z is just as fast as a 911-997 C2 +/- because the 997 does 12.9-13.4 s. The Z does all of that with stock power. The 13.3's is what they got, & it is accurate, but prepped like the Mustang testers who re-tuned the Mustang V4 (15.0 s) Turbo's turbo - The Z does 12.8 s @ 108 mph with stock power - no tuning needed. I don't know what planet you fell off of, but my Z does 12.8 s stock power; you can use your imagination for the new models with 350 hp. Recorded stock 4.4 s 06- mph. The 370Z's low 13 s 1/4 time translates to beating mid to high 420-612 hp 12 s cars because of handling. After launch the 370Z beats the EVO & like he said, the Z does better on mid to longer tracks versus the EVO. Handling is its main tool for curves, turns, entry & exit speeds. Its an RC car on rails. I recommend it. Lol, I love when people compare modified cars to those from factory. FROM FACTORY, a low-13sec car is FAST, especially if it's a N/A 6cyl. If you want to talk "bolt ons", a twin-turbo kit 370Z, properly tuned and fitted can easily run low 10's. It's a light weight car with a small engine - lot's of potential. For a stock car, 13's is nothing to be shunned for, especially for a car worth under AU$50k. 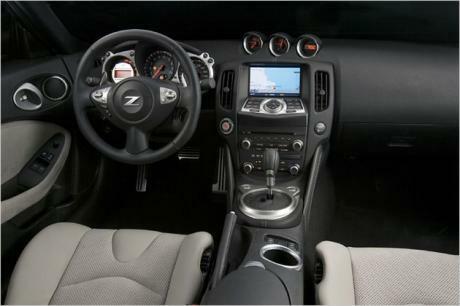 is Nissan z370 a girley car like Audi A4????? I mean no offence in what I said. I just don't consider cars that run low 13's (in the 1/4) to be fast. I'm just used to quicker cars is all. Hell, my buddies SUV runs 11's. And I know a friend of a friend with a 9 second tbss. Speed is relative, and to me, 13's isn't very quick. Most 90's LS stuff and even mod motor stuff is into the 12's with bolt ons. It's just my opinion. I'm just saying that its best trait is its handling. And of course you should be proud of it, it is an impressive sports car, especially for a 23 year old. Viking i like you, u give great info thats very interesting and u are kind to me. I wouldn't boast about its acceleration, but I would boast about its handling characteristics. It is a great handling car. @jap4 yeah the 370Z is quite quick, quicker than a 1995 Corvette that I used to own, but not quite as fast as the 2002 Corvette that replaced it (although it would be a very close race). My current 2011 Mustang GT is quicker still. Your 370Z has excellent handling, better than either of the those Corvettes. You will find it lots of fun to use the comparison feature of this site. There are still a few glitches, but most of the info is legitimate, and comes from magazine test sources. 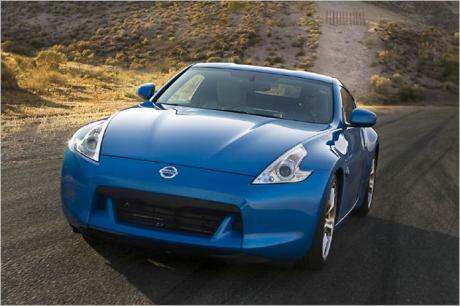 You will find that the 370Z lap times are superb. Long tracks and multiple laps do present a problem sometimes however, since the stock brakes, and engine tend to overheat. Thanks viking, iv only just found this site, its an interesting read. @jap4 welcome to the forum. If you have been here awhile, then obviously I haven't been paying attention. I think you have a good looking sportscar with excellent handling. The acceleration is very good, but handling is its best trait. You haven't raced many cars then apparently. The Z's acceleration is good by 90's standards, sorry. Bought a 370z 2months ago and im so happy, not much has beaten the acceleration yet except a 911 turbo and tvr, such an awesome drive, everyone shud hav a go! Good lap time at Grattan, but once again design problems led to over heated brakes and engine. One lap at a time with lots of cool down between laps was required. 300whp NA from bolt-ons was good for the early 2000's. Hell, most LS1's made that stock through the M6. The car does exactly what it needs to do. It's cheap, it's fast and very receptive for an n/a engine to aftermarket modifications. Do your typical breather mods and it makes +300 whp. I think it looks good, too. What kind of speed are you talking about? if its a straightline, than its the 370Z, but the Evo will have better traction of then line, and actually a faster 0-60mph, but after that, the Z will be ahead. and as for a track, on a short track, id give it to the Evo, but on a longer track, that goes to the 370Z. Why don't you just use the compare feature at the top of the page? give me a hand whats faster? 2009 370Z or 2009 Lancer Evolution GSR? I am sure it can do better but thats what they have tested in southafrica(the only number I have seen so far for 0-200)...the problem there is they do their test in Johannisburg at very high altitude (1400m abouve sea level) which reduce the perfromance of n/a engines dramaticly, the reason why the twin turbo Z4 35i was much quicker in the acceleration tests and the much over 60hp weaker but turbo powered TT-S reached the same acceleration times. the time 0-200 km/h = 24.7 ?? .. is it slower than Z350 which can go 0-200 km/h = 22.7 ? !! !